Have You Been Through These Doors Lately? A Surprise! I spend a lot of my time shopping in big box stores for my family. Today, I went into Target to buy (wait for it) a new laundry basket. Boring… BUT, I found myself transfixed at the front of the store. There were pure white mannequins – some with heads and some without – wearing outfits. Usually, that wouldn’t cause me to stop in my tracks. But there was something different about them. Wait a minute! She has some curves. Check that out! Is it possible that Target is recognizing that the super skinny body type is only ONE body type and there are others that should be shared and promoted? This image was above the white bikini lady. Yesss!!!! I put this image - me in my bikini – up years ago in the hopes that I would inspire others to feel good about themselves. She looks like she feels good about herself (and she is beautiful). 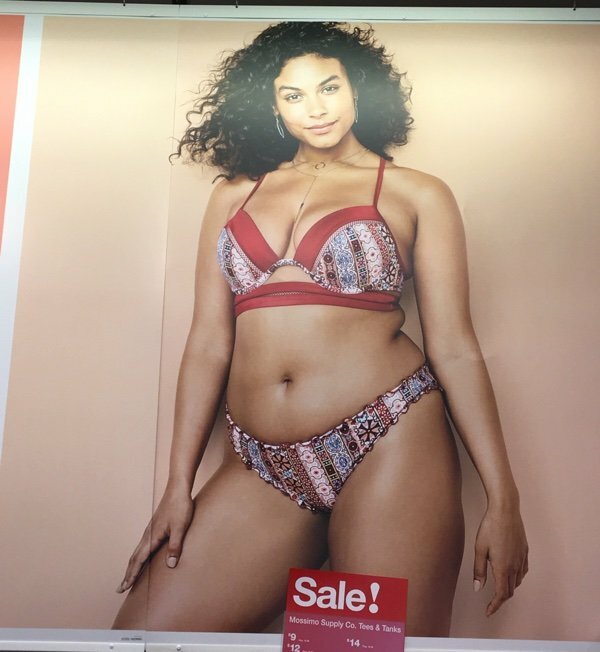 A store like Target can make a huge difference in how we view ourselves. As I wrote in The Hurtful Messages Our Daughters Can’t Avoid – we are sent messages all the time about how we should look. These messages lack diversity - both in body shapes and races of people. I am pretty sure I have that exact outfit – black t-shirt and capris. She is looking fierce (except for her lack of face and pure white coloring). Perhaps there was a sale on pure white plastic? They are the mannequins we are used to seeing – skinny and tall – like super models. Target isn’t doing this to be “correct”. They want to sell more clothes and someone at headquarters realized that women come in different shapes. How revolutionary!! 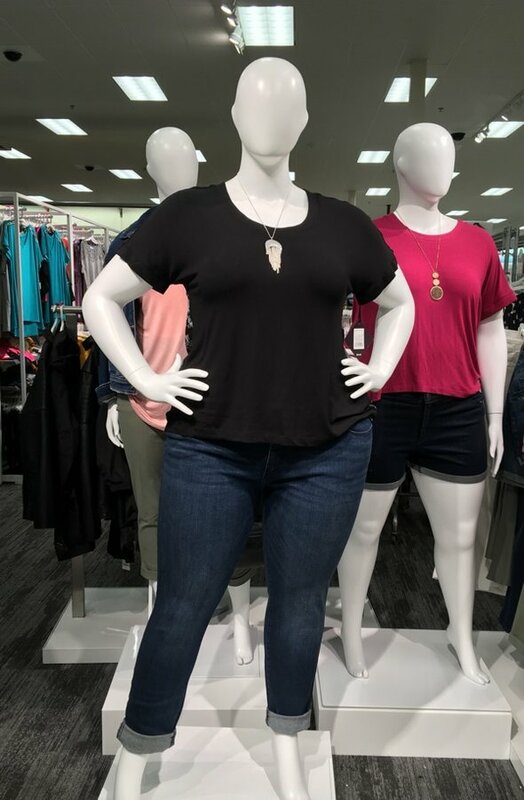 You can see yourself in those shapes and want to buy the clothes because of how they fit on the mannequin instead of wondering if the clothes are going to make it across your wide hips, over your booty, or be too tight around the chest. And, if I had needed yet another pair of capris or a black t-shirt – they would have sold me. Men, I guess, will also have to wait for different shaped models (and cuter clothes - I think this is ugly). The only male mannequins were very muscular. I tried to talk to this one but I think he was busy. Thank you, Target, for supporting us in our acceptance of ourselves. 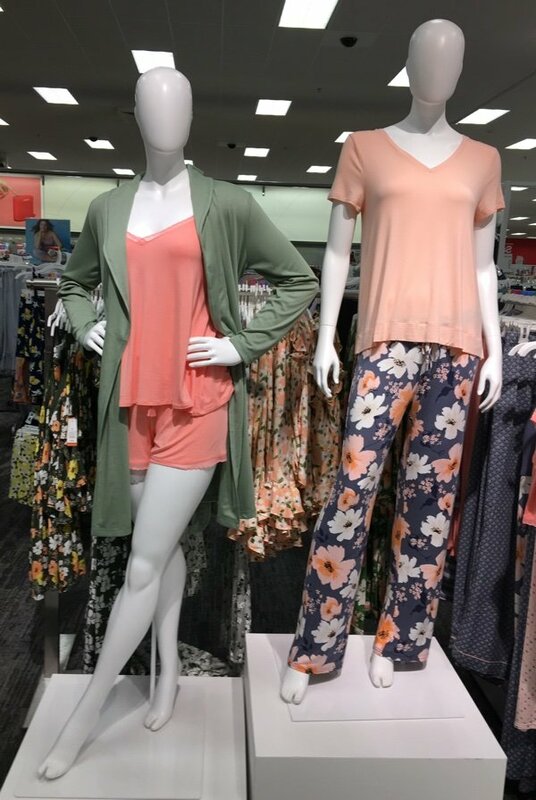 Have you seen the new Target mannequins? What did you think? I don’t shop Target but it is nice to see someone is finally getting it. Thanks for sharing. I LOVE, LOVE, LOVE this!! Well, now I have an excuse to go shopping (don't tell my husband). I will be heading to Target this week. I was there yesterday and the mannequins DEFINITELY drew my attention! ok, as one of the males who enjoy your posts, and try to follow your advice, I just got one thing to say --- "cute" clothes for guys?? ?....not gonna happen.....nope.......we don't do "cute"....ok? Target does NOT carry Petites. I can’t buy any of their great clothes. I try not to shop there for other things. I have spoken to several store managers . I did not notice when I was there last week, but I did not go through the clothes section. I will look next time I am there. I do not shop Target because of their dressing room/bathroom policies. I think keeping our daughters, mothers and love ones safe is much more important than curvy mannequins. I am disappointed in Target and Snack Girl. @Kevin - You win - no cute clothes for men. What was I thinking? :) Thank you for your comment. I also refuse to shop at Target due to their policies. That’s great. Also, the same way you don’t like being shamed for being your size don’t shame others for being thin. Some women are naturally thin, some are thin by choice. I agree with you T. Women come in all sizes. All skinny wasn't right just like all curvy isn't right. Thank you, Lisa, for underscoring this. One of the things I like about Target is that all kinds of people shop there. Now I have one more reason to enjoy what they do! I’m 70, and honestly, I’d given up hope that there would be lots of shapes of mannequins. I agree—we need to show all sizes and shapes. Thank you for bringing our focus to this!!! I am on the thin side and 5'2". I never was discouraged by the tall mannequins. I really don't see why this is such an issue. I don't understand your comment Lisa about wondering if the clothes are going to make it across your wide hips, etc. How can you tell by looking at the mannequin? Don't you still have to try them on? I am really confused by this post. What are the dressing room/bathroom policies at Target that people find upsetting? I have not used either there in quite a while, so I guess I'm behind the times. I think the curvy mannequins are great! I've not seen them, but will definitely check it out next time in. I have to say the newer ones that are completely white, or worse, the ones with no heads (creepy), seem strange & odd to me. But anything that demonstrates to any portion of our culture, that you don't have to be stick thin to be beautiful, is wonderful in my book. I do think they should have a variety of sizes to be doing this right, but for years the norm of mannequins being so thin, you can see where the clothes have to be pinned on them ... this is just ridiculous! Of course there are very thin women, just as there are very curvy women. Thank you Lisa for doing this piece! After a long, cold winter in many states, Americans are ready for summer, anxious to start the season. With picnics, cookouts and pool parties on many calendars, shoppers will be headed to stores to pick up last-minute items, barbecue fare and summer supplies. 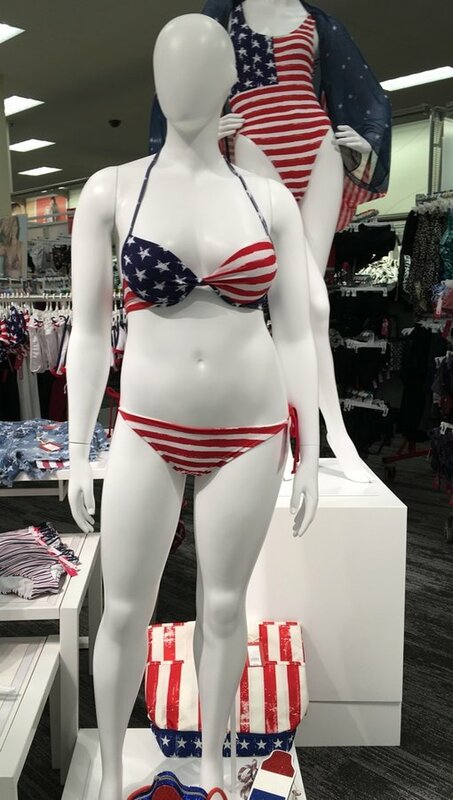 AFA is reminding shoppers this Memorial Day week to steer clear from Target, which remains committed to its dangerous and misguided bathroom and fitting room policy. Target executives still won't acknowledge that the powerful #BoycottTarget movement has anything to do with waning business. But we know better. Millions of shoppers and thousands of families no longer spend their hard-earned money at Target. There is strength in numbers and this significant community is making a difference. 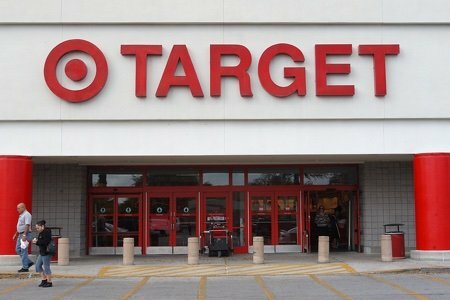 The refusal of shoppers to patronize Target sends a message to shareholders and Target executives that morals mean more than convenience and safety outweighs personal preference when it comes to shopping at what once may have been their favorite store. Just as important, besides not shopping at Target for Memorial Day or anytime this summer, we remind shoppers to steer clear from shopping online at Target as well. Clicking through purchases may seem 'safer' than entering stores with dangerous bathroom policies, but shopping online still drives revenue to Target. It's clear that families who have chosen to shop elsewhere - both in-store and online - are making a huge difference. SIGN—If you haven’t already, sign the #BoycottTarget pledge. If you have signed, keep the commitment not to shop at Target stores or online. SHARE—Ask family, friends and church members to sign the pledge. One effective strategy is to voice concerns politely but firmly on Target's Facebook page and other social media sites using #BoycottTarget. The message from the American Family Association did not clarify exactly what is dangerous and misguided about Targets bathrooms and fitting room policies. I think before signing something without being given the exact details of what makes Targets policies dangerous is unwise. I believe in making informed decisions and if the post from above was supposed to inform us it does not. You are right Laura. Please look up American Family Association to get all of the info. What are the dressing room policies???? The problem is that this opens the door (pun intended) to people who are prone to sexual abuses, such as looking through cracks in bathroom stall doors, taking pictures of women and girls, touching woman and girls, etc. Many such cases have been reported. While I agree everyone is entitled to their own opinion, the fact is transgenders have been using the bathroom of their choice for years. It is only since society has become more open about gender identity that this has become an issue.